Freedom To Save: FREE lovetub pudding! Get FREE lovetub pudding! 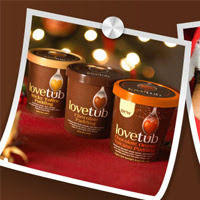 All you need to do is "Like" Lovetub Puddings's Facebook page for a chance to grab a FREE lovetub pudding! You’ll also be able to share the festive cheer with your loved ones by entering our prize draw to win £750 towards a perfect family Christmas!